Tot School was a little scattered this week since Kaleb started acting very tired and lethargic on Wednesday and then that night began complaining that his ear hurt. We've never had one this young actually TELL us what was wrong with them, so at first we didn't really give it much credit. But it was so sweet (and sad all rolled into one) - he kept putting his little hand on his ear, leaning his head to the side and saying "hewrt, hewrt" in that cute little toddler voice. And sure enough he had a double ear infection. Although we weren't quite as focused, we did get a few things squeezed in to our days. I pulled out a bunch of my teaching supplies from years ago and actually hung them up! When I use tape on our walls it leaves a nasty residue, so I finally bought some of the 3M adhesive tabs to hold up the shapes and colored crayons. And Kaleb LOVES them. 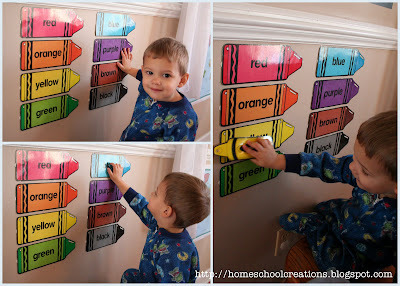 He's been running over to the wall and naming colors, not the right ones, mind you, but at least his naming colors!! I pulled out some of the smaller crayons I had and he would hold them up to the matching crayon on the wall and repeat the color after I named it. We also spent some time doing puzzles this week again. 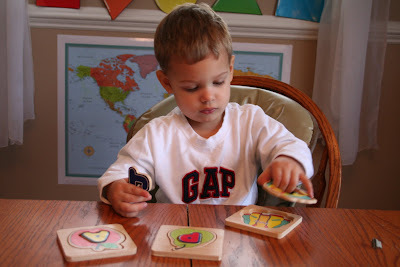 We're using the 3 part alphabet puzzles and only doing a few at a time so that it doesn't get too overwhelming for him. 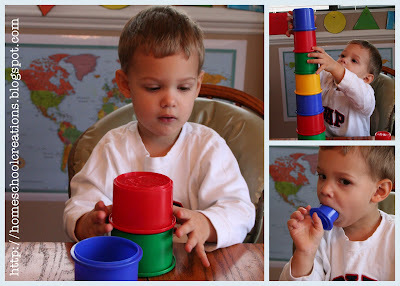 He pulled out his stacking cups (Discovery Toys) and also his big buckets (Tupperware) to stack inside each other and also have fun stacking in a tall tower and then know down...or see if it would fit in his mouth. While it's great to strap him in at the table, it's also hard because those little arms can only reach sooooo high! Be sure to head over to Carissa's at 1+1+1=1 for some more Tot School posts and ideas.